100,000 apps sounds like a pretty good number. I only use about 100 apps on my iPhone and so 100,000 is a lot to choose from. But there was this nagging feeling that the number of apps available is actually a pretty meaningless number. What I really care about is my apps. The apps that satisfy my needs. But which apps are those? Well, I recently published a post about my favorite apps on the iPhone. I have distinguished between the coolest and the most useful apps. That’s a good list to start. In the article, I have mentioned a few solid alternatives and so let’s add them to the list too. I should also add a couple of service apps for services I use a lot like Marriott and Air Canada. They didn’t make the list but let’s see. And for a good measure, let’s add some of the event specific apps to the list. What could be more important right now than Wimbledon, Tour de France and the Olympics? The results? As expected, Android scored relatively high and by far the best. 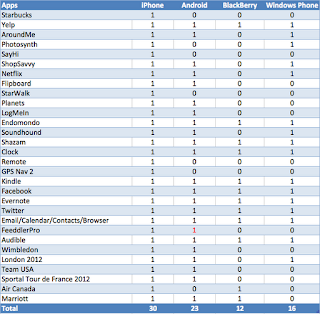 With 23 out of 30 apps available on Android, Google is not on the same level as Apple but certainly in contention. Microsoft Windows scored 16 out of 30 apps which was disappointing. That said, most of the big providers such as Netflix, Audible, Shazam or Evernote have made it as far as supporting Windows by now which is encouraging. But if you are looking for any more specialized apps for your Windows Phone, forget it. BlackBerry, as expected, is far behind and considering that they are in the process of switching operating systems to QNX, the apps shortage is not going to improve anytime soon. So there you have it. The next time any of these vendors start throwing around numbers like hundreds of thousands of available apps in their apps store, remember that such numbers matter little. What matters is - do they have the apps I need? You are right, numbers mean nothing. I probably have about 15 apps on my Windows Phone, and I would say they all look and feel better than their counter parts on both droid and iPhone...But the lack of a particular app, is the biggest barrier to entry (or at least the belief you wont have the same apps on that ecosystem). At the moment I would say you also dont take into account the quality of the app nor the age of the ecosystem. The iPhone and Android have mature ecosystems, while Microsofts Windows Phone is very young, and when you look at the figures has out performed app growth of both Droid and iPhone. Many of the major app developers have also stated that they are looking forward to Windows Phone 8, and so in more recent times, have been holding fire on delivering their apps. I believe that means the app store growth will accelerate further for Windows Phone (keeping in mind that its the same OS between PC, Tablet and Phone, so tiny changes to code allow developers to deliver an app to all devices), which will mean all those apps you love on iPhone or Android will be available on Windows Phone too. Thanks for your comments, Andrew. I agree that the quality and maturity of the ecosystem is a factor. I'm not quite sure how to measure the quality at this time - I suspect that it is a highly subjective matter. So this is basically the end of the duel between iPhone and Blackberry. Odd list of apps, you should use only the top 20 sites (apps) because there are lot of apps like BBM that you never find in other platform other than BB, Dead trigger is only in Android, iMessage is only in iPhone. I'm sure that there is equivalent apps that supply some of those you mention. More apps is one indicator but how many of those apps are currently in use? what if Apple build 200M diferent clones of tetris.. that makes iPhone better?